Review published in IJPE, Vol. 9, No. 4, July 2013, p 465. The Foreword to this book is written by the eminent computer scientist Professor Judea Pearl who is the originator of Bayesian networks and is one of the leaders in advancing the theory and applications of Bayesian networks. As Judea Pearl states, this book is different from other books in this field with its focus on ensuring the reader can build practical Bayesian networks without going into the details of the theory and algorithms. After going through this book and carrying out a number of applications with the free online software tool AgenaRisk, the reviewer certainly agrees with Professor Pearl’s assessment. But there is also an adequate treatment of the algorithms underlying Bayesian networks for those interested in it as well as the treatment of underlying the concepts of probabilistic thinking and Bayesian analysis. AgenaRisk , even though being a lite version, is capable of handing more complex Bayesian networks constructed for risk assessments and decision analysis supported by the many examples in the book. AgenaRisk has many built-in functions and simulation capabilities which greatly expedites the construction and implementation of Bayesian networks. The book opens by presenting the types of practical problems that can be solved by Bayesian networks which include disease diagnosis, safety and risk assessments, evidence analysis, and decision analysis. The limitations of carrying out simplistic probabilistic and statistical analyses are also described. In chapter 2, there is a good discussion on why causal relations are necessary in a risk assessment and why causal relations are different from simple correlations. As throughout the book, the concepts are made tangible with practical examples of modeling the causes of a traffic accident and a flood occurrence. In Chapter 3, the authors provide a good discussion of the need to treat knowledge uncertainty and subjectivity in risk assessments and decision analysis. The differences between frequentist and subjective estimates of uncertainty are described, where each is applicable, and how the different estimates can be integrated. Chapter 4 covers the fundamental concepts involved in constructing a probabilistic model particularly for risk assessment and decision analysis. There are illustrative examples including developing the probability for a failure occurrence and a traffic accident. The use of AgenaRisk previewed. The concept of a prior probability assessment and the use of Bayes theorem to update the probability assessment is discussed in chapter 5 with a set of assorted examples. The concepts of tests giving a false positive or a false negative are discussed. AgenaRisk is used for applications to disease diagnosis and evidence analysis. Chapter 6 lays the foundation for transforming a relational network into a directed graph and a Bayesian network. The mathematical underpinnings of a Bayesian network are sufficiently covered to provide a basis for valid construction. Topics covered include the identification of parents of an event, the identification of conditional independencies how probabilities are propagated. An overview is also given of the steps and practical considerations in constructing a Bayesian network which is covered in greater detail in the next chapter. Examples expand upon the flood occurrence causal network and a construction of the causal network for the reasons for being late to an appointment. Chapter 7 presents the meat of constructing practical Bayesian networks. The basic elements of a Bayesian network are covered including the structural definitions of causes and measurements; definitions of nodes and synthesis of nodes to avoid combinatorial explosion; inductions from symptoms and observations; and guidelines in handling and modeling practical problems. The examples covered are more involved and include modeling the results of quality testing, determining the operational reliability of a system, and assessing signal detection outcomes. AgenaRisk is applied to these problems. The next chapter focuses on the different types of nodes that can be defined and that can be handled to describe different states or values or a variable. Labeled states, rank ordered states, the variable having discrete values, and the variable having continuous values can be handled. Boolean nodes can be defined involving AND/OR logic as well PRIORITY logic. Mathematical nodes can be defined involving mathematical functions of inputs such as MIN, MAX, and other standard functions. AgenaRisk can also handle standard probability distributions assigned to a node variable such as the binomial, truncated normal, and exponential. The advantage to the user is that these capabilities are built into AgenaRisk. The construction of discrete and continuous distributions in quantifying the probability associated with a node is described in chapter 9 in detail. The use of the dynamic discretization algorithm in AgenaRisk is a focus in which the discrete intervals for a numeric variable are optimally selected through a simulation algorithm. The use of AgenaRisk’s truncated normal distribution is also described in which the bounds, average value, and standard deviation are assigned to a continuous random variable. The examples are more detailed and include defect inspections, an automobile purchase, and customer arrivals. Chapter 10 expands the use of Bayesian networks to testing hypotheses and in selecting models for prediction. Bayesian versus classical hypothesis testing is described and Bayesian confidence intervals versus classical confidence intervals are described and compared. Also covered is the use of Bayesian networks in updating prior values of the parameters of the likelihood based on a set of data using flexible priors and likelihood. Of added value is the process covered for constructing the best distribution for future prediction. Data fitting, weather predictions and legal applications are described. Constructing a Bayesian network as a form of fault tree to model the causes of system failure is described in chapter 11. Multi-states as well as binary states can be handled. Common cause contributions can also be included. Diagnostic analyses can be carried out to determine the likelihood of causal events of a given event having occurred. The construction of large fault trees can be done but can be tedious because of the repetitive modeling required. The construction of a Bayesian network as an event tree is also described. Examples include models of computer system failure, derailment failure, and financial loss. In chapter 12, the modeling of time dependent reliability with a general distribution and Markov-type modeling of the dynamic evolution of a system through different states are described. Dynamic event trees including the modeling of hot, cold, and warm standbys are also described. Examples include models of the reliability of a system with warm and cold spares, software defect prediction, posterior assessments of the hyper parameters of a mixture of component failure rates, and sensor state predictions. Finally, the last chapter covers the use of Bayesian networks for evaluating evidence in the legal arena including the choice of priors and the handling of dependent evidence. Agatha Christie’s “Witness to the Prosecution is used as an example in constructing the Bayesian network. 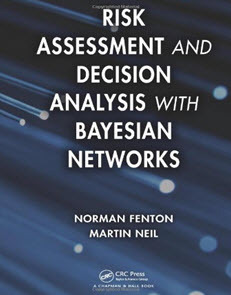 In the opinion of the reviewer, this book will be found very useful to practitioners, professors, students and anyone interested in understanding the application of Bayesian networks to risk assessment and decision analysis. Having many years experience in the area, I highly recommend the book.